For business or pleasure, when in Hurghada book your stay at the comfortable and family oriented Iberotel Makadi Oasis Resort Hotel. 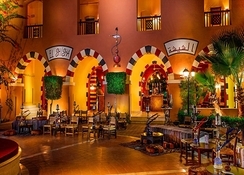 This fabulous resort hotel features 521 air-conditioned guestrooms and suites built in the style of an Arabian village surrounded by palm trees and located on the Bay of Makadi. 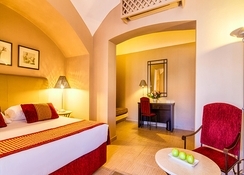 The interior design of all guest rooms at Iberotel Makadi Oasis blends traditional Moroccan and Arabian style. This is where the cool waters of the sea and the warm Egyptian hospitality combine to create the memories of a lifetime. Visitors to the Iberotel Makadi Oasis Resort can embark on an adventure of discovery by diving in the area with its rich and colourful marine life ranging from fish to corals. After all that excitement the Spa is a perfect place for total relaxation. The city centre is nearby with lots of shops, cafes, restaurants and attractions. 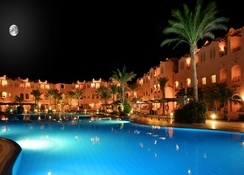 For an unforgettable holiday or business trip to Egypt, the Iberotel Makadi Oasis Resort Hotel is right on target! 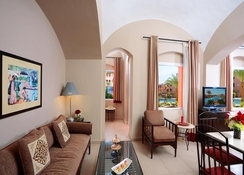 Hurghada Airport is 30 km from the hotel. Local Tips: Book a trip on the sci-fi bubble contraption called the Aquascope at the nearby Hor Palace. You will be submerged in a kind of semi-sub cabin with nine other people for about an hour and the show is natures best with Moray Eels, Lionfish and maybe even a shark or two. 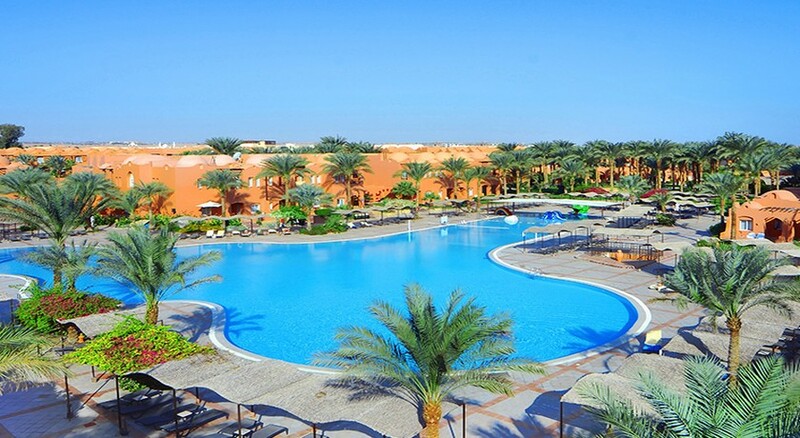 The facilities at the Iberotel Makadi Oasis Resort Hotel offer beautifully maintained gardens, fabulous facilities and comfortable accommodation for an outstanding holiday. 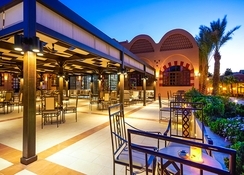 Food, drink and entertainment: The main restaurant serves a wide range of international dishes and Egyptian specialities. There is a lobby bar, pool snack bar and beach bar. Various sports activities during the day. Evening entertainment programs. National and international dance shows. 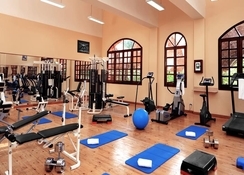 Sports, games and activities: Swimming pool (heated during winter, free beach towels and sun loungers, Tennis & Squash, table tennis, Billiards, Boccia, Darts, archery, Gym, Wellness Centre, Sauna, Aroma-therapy Massage, Steam bath, Jacuzzi, Aerobic & Fit Boxing, Diving, Surfing. Other activities include most water sports, deep sea fishing, beach volleyball, camel rides and more. From May 2011 guests staying at the Iberotel Makadi Oasis will have unlimited access to the new Makadi Aqua park featuring 46 slides a 280m long lazy river and a wave pool. A free shuttle bus is provided at set times throughout the day. For the Kids: Childrens pool, kids club, kids animation, playground, special children menus, baby cots and extra beds. Baby-sitting upon request at extra charge. Additional: 24-hour reception, 24-hour concierge service, safety-deposit boxes, on-site shopping, currency exchange, conference room, laundry service, Internet services and fax, in-house doctor, Shuttle bus to Hurghada, Limousine service available, 24 hours, 7 days a week.